Copyright: © 2016 Marler TE, et al. This is an open-access article distributed under the terms of the Creative Commons Attribution License, which permits unrestricted use, distribution, and reproduction in any medium, provided the original author and source are credited. Typhoon Dolphin damaged forest resources in northern Guam on 15 May 2015, and we assessed the responses of the native tree Cycas micronesica to the destructive winds. We compared the damage to that of previous typhoons, evaluated topographic traits that affected tree damage, and assessed the influence of prior management decisions for in situ conservation plots on damage. Snapping of stems near the ground was greater in this typhoon than in past typhoons, confirming predictions that chronic infestations of non-native insect herbivores compromised the biomechanical integrity of stem tissue. Tree failure as snapping of stems or uprooting/toppling increased from 1% to 23% along an elevation gradient that faced windward, indicating orographic lifting increased wind force and mediated the tree response. Two years of conservation management within in situ plots reduced tree damage and saved up to 16% of the population, depending on site. Case studies such as this one are needed to more fully understand future impacts of increased frequency of intense TCs that are predicted with climate change models. Cycas micronesica is native to the Micronesian islands of Palau, Yap, Guam, and Rota . The northern end of this range is subjected to frequent TC events . The species is unique in many respects, including resilience following TC damage . Invasions of the nonnative armored scale Aulacaspis yasumatsui Takagi and leaf miner Erechthias sp. Meyrick were documented on Guam in 2003 [5,6], and invasion of the non-native butterfly Chilades pandava Horsfield was documented in 2005 . Plant mortality was extensive , resulting in listing as Endangered under the International Union for Conservation of Nature and Natural Resources Red List  and Threatened under the United States Endangered Species Act . Physical geography is one of the many factors that influence the spatial effects of damage to forest resources when a TC occurs. Geomorphology influences the relative exposure of various habitats to TC-force winds. The influences of valleys, ridges, elevation, aspect, and other features of the terrestrial systems on vegetation damage during a TC may not always correspond to expectations [11-15]. Management of forest resources prior to a TC event may also influence the resistance and resilience of a terrestrial system to damage by a TC. Anyomi and Ruel  reported that wind throw damage was more influenced by silviculture practices imposed on 10-20 ha blocks than by fine-scale practices imposed on 0.25 ha plots, illuminating the importance of large spatial traits when studying the influence of surrounding habitats on individual tree damage. To our knowledge, the influences of topographic features on TC damage to vegetation have not been reported for any Micronesian island. Similarly, the manner in which conservation management actions prior to a TC influence resistance to TC damage have not been reported. Our primary objective was to assess the damage of Guam’s C. micronesica population during Typhoon Dolphin. The second objective was to evaluate the efficacy of management protocols for in situ conservation plots in reducing TC damage. The non-native insects immigrated into the habitats that contained the management plots in early 2005, inflicting 10 years of infestations prior to Typhoon Dolphin. The third objective was to assess proximate causes of catastrophic forms of C. micronesica tree damage in relation to topographic relief and aspect. The sites selected for this study encompassed two in the west coastal habitat, two in the east coastal habitat, and four on the uplifted plateau that separates the two coastlines in northern Guam. General topographic traits of this terrain are depicted in Figure 1. The west coast habitat that we included increased to ca. 160 masl within 0.80 km of the shore. The east coast habitat that we included increased to ca. 150 masl within 1.35 km of the shore. The plateau where our plots were located was ca. 165 masl at the west extreme and ca. 155 masl at the east extreme, and was 2.11 km wide. 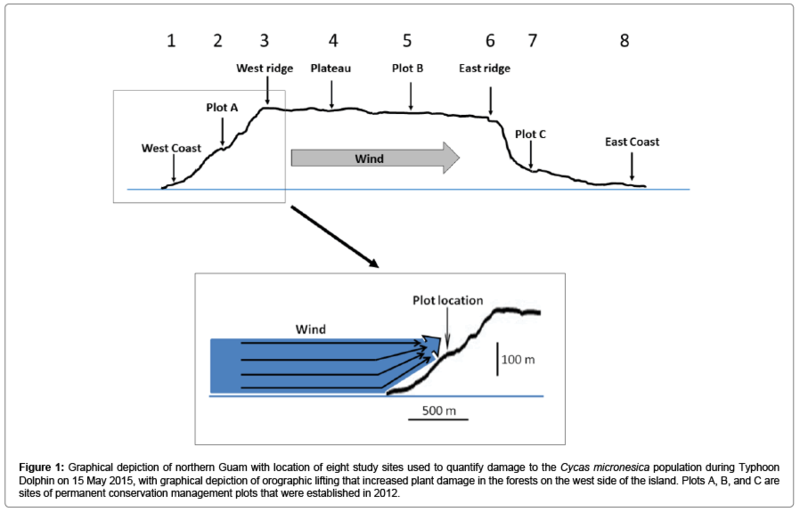 Figure 1: Graphical depiction of northern Guam with location of eight study sites used to quantify damage to the Cycas micronesica population during Typhoon Dolphin on 15 May 2015, with graphical depiction of orographic lifting that increased plant damage in the forests on the west side of the island. Plots A, B, and C are sites of permanent conservation management plots that were established in 2012. These sites exhibited similar pedology, and the soils for every damage assessment plot were coralline limestone substrates. Plots on the flat plateau were Guam series (Clayey, gibbsitic, nonacid, isohyperthermic Lithic Ustorthents) and plots on precipice and coastal forests were Ritidian series (Clayey-skeletal, gibbsitic, nonacid, isohyperthermic Lithic Ustorthents) . These soils are similar chemically, but dissimilar topographically. The Ritidian series exhibits greater slope and more karst outcrops than the Guam series. Eight damage assessment sites were positioned to fully characterize the windward to leeward impact of Typhoon Dolphin’s winds. Sustained winds on 15 May 2015 at this latitude were 135 km·h-1, and peak winds were 171 km·h-1. The eight locations included the sites of three 0.5 ha in situ C. micronesica management plots that were established in northern Guam in 2013 (labeled plots A-C in Figure 1). Plot A was on the windward side of the island and was positioned 0.52 km leeward of the shore at 85-95 masl. Plot B was on the plateau at 165-168 masl, and was positioned 1.50 km leeward of the edge of the precipice in the west coast habitat. Plot C was on the east side of the island and was positioned about 0.25 km leeward of the uplifted plateau at 55-60 masl. We collected plant damage data using five linear transects per damage assessment site. The field work was accomplished 16-18 June 2015, and 29-30 June 2015. The 4-m wide transects were oriented northsouth to ensure each tree within each transect was at the same position with regard to TC wind direction. The protocol was to include 100 trees per transect such that there were 40 transects and 4,000 trees that were assessed. We recorded data on C. micronesica trees as three categories: standing, windsnap damage (stem broken near ground level), and windthrown damage (uprooted on windward side and toppled). The data were subjected to the Kruskal-Wallis one-way ANOVA to test the null hypothesis that no differences in damage occurred among the eight sites. In order to evaluate the efficacy of the C. micronesica conservation protocols, we collected the same damage data for every tree within each of the three in situ conservation plots. The influence of habitat on C. micronesica tree windsnap damage was highly significant (P=0.0002). One tree per 100-tree transect exhibited windsnap during Typhoon Dolphin at the east and west shore habitats (Sites 1 and 8) and at the leeward habitat that was protected from TC winds by Guam’s uplifted plateau (Site 7) (Table 1). The three leeward sites of the exposed plateau (Sites 4-6) exhibited windsnap of two trees per 100-tree transect. Windsnap damage increased dramatically to about 20% at Sites 2 and 3. Table 1: Number of Cycas micronesica trees that failed per transect during Typhoon Dolphin on 15 May 2015 in northern Guam. Stem failure indicates windsnap of stems at ground level. Root failure indicates wind throw by uprooting of the root plate. Eight locations coincide with graphical locations in Figure 1, with location 1 being west coast and location 8 being east coast. Mean+SE, n=5 transects of 100 trees each. Adjusted H is the Kruskal-Wallis test statistic. Habitat also influenced C. micronesica tree damage as windthrow during Typhoon Dolphin’s destructive winds (P=0.0116). Sites 1, 7, and 8 exhibited minimal damage as windthrow (Table 1). The remainder of the sites exhibited 1% to 2% windthrow damage. Sites 3 and 7 were valuable for determining if eddy formation influenced tree damage. Site 3 was susceptible to potential eddy formation because the rapid increase in elevation on the windw side of the site was abruptly discontinued at the western edge of the plateau. Site 7 was susceptible to eddy formation because the abrupt decline in elevation at the eastern edge of the plateau after the TC winds had passed more than 2 km over the flat plateau. We found no trees of any species that were toppled in directions other than the primary wind direction of Typhoon Dolphin. Therefore, no evidence of eddy formation was found at either site. The C. micronesica tree population within the in situ conservation plots that had received two years of management actions exhibited TC damage that was highly contrasting to that of the tree population outside of the conservation plots. The management actions protected 100% of the conserved trees from windthrow, as none of the trees within the management plots were uprooted. Similarly, the conservation plot on the plateau (Plot B) and the plot on the protected leeward site (Plot C) exhibited 100% protection from windsnap damage. In contrast, Plot A was fully exposed to Typhoon Dolphin wind direction and exhibited 3% windsnap of the trees within the plot. The direct damage to Guam’s C. micronesica population has been reported for several recent typhoons. Typhoon Gay with sustained winds of 155 km·h-1 caused minimal structural damage to Guam’s C. micronesica (reported as C. circinalis L.) population in Nov 1992, but generated partial defoliation due to aerosol deposits of salt spray . Supertyphoon Paka with sustained winds of 230 km·h-1 caused less than 2% windsnap, less than 2% windthrow, and decapitation of about 10% of C. micronesica trees in Dec 1997 . Typhoon Chaba with sustained winds of 109 km·h-1 caused minimal windsnap or windthrow, but decapitated 18% of the C. micronesica population in Aug 2004 . The substantial stem breakage at heights above ground level was attributed to prior stem damage by the stem borer Dihammus marianarum Aurivillius. In addition to these published observations, we have observed damage to Guam’s forest resources following many TCs since 1992. The windsnap of C. micronesica trees during Typhoon Dolphin’s sustained winds of 135 km·h-1 was more extensive than for all past TCs. The combined windsnap and windthrow damage at Site 3 was 10-fold greater in Typhoon Dolphin than for any Guam habitat in any past TC that we have observed. The in situ C. micronesica conservation actions that were initiated two years prior to Typhoon Dolphin included systemic insecticide protection from Aulacaspis yasumatsui, fencing to exclude non-native ungulates, removal of non-native plants, and guy wire installation to support the C. micronesica trees during TCs. These conservation actions were based on a management plan that was developed and reviewed by international cycad conservation experts, but the actions were not subjected to a stressor that tested their efficacy until Typhoon Dolphin. The management decisions for these in situ conservation plots were validated by the TC event. Windsnap of stems within the central and east coast management plots was nil, while windsnap outside of the management plots was 2% adjacent to the central plot and 1% adjacent to the east coast plot. Windsnap of stems within the west management plot was 3%, while windsnap outside of this plot was 19%. Initial positioning of the permanent C. micronesica management plots was based on spatial features of northern Guam including topographic relief and aspect. This landscape factor was considered of importance to exploit land mass for protection of some of the in situ conservation plots during each single TC disturbance event. For example, the trees within some forest micro-sites experience no damage even during the strongest of TCs because of terrain and wind direction . The direction of the most damaging winds on a small oceanic island during any TC event depends on several factors including closest point of approach of the eye, radius of the TCforce winds, direction of the track, and speed of the eye movement. Therefore, the strongest winds during a TC are generally unidirectional, but can come from any direction depending on the interplay of these factors. For Typhoon Dolphin, the majority of tree blowdown indicated catastrophic winds were from the west. Therefore, conservation actions within the management plots resulted in the greatest success for protecting the population in the west coast plot where TC wind exposure was the greatest. A measure of protection of the population may be calculated as the difference in percentage of windsnap plus windthrow inside versus outside of the management plots. This calculation indicated the east coast plot exhibited 1%, the central plot exhibited 4%, and the west coast plot exhibited 20% protection of the extant C. micronesica population during this TC event. These results validate the initial conservation decisions concerning placement of the in situ C. micronesica management plots with respect to topography. Sites 3 and 4 were fully exposed to the TC-force winds and were about 0.75-m apart, yet the damage to the C. micronesica population was 23% at Site 3 and 3% at Site 4. The central Site 4 was located on relatively flat, open terrain that was 800 m leeward of any topographic feature that may influence wind behavior. In contrast, Site 3 was located at the position where the land surface increased from sea level to an elevation of 160 masl within 800 m from the shore. Slope aspect was 275o, which was essentially in the direction of the most damaging TC winds on 15 May 2015. The west coastal Site 1 was upwind of this site, but exhibited minimal damage that was similar to Sites 4-6 on the plateau and Sites 7 and 8 on the east coast. These results evince orographic lifting as the main causal mechanism of increased plant damage at Sites 2 and 3 (Figure 1). The force of wind on a fixed object such as a C. micronesica tree is proportional to the wind speed squared . Therefore, an increase in wind speed as the orographic lifting magnified the force of the TC winds would have greatly increased the force exerted on the trees in this west coast habitat. Marler  predicted that the chronic pressures of A. yasumatsui would compromise the intrinsic resistance to TC damage that C. micronesica stems possess. Winching techniques and three-point bending tests were utilized to directly measure the decline in stem strength after two and five years of A. yasumatsui infestations. These empirical data were used as a proxy for potential TC damage and to justify the guy wire installations to protect trees within Guam’s in situ conservation plots. The accuracy of this proxy was never confirmed until Typhoon Dolphin. Supertyphoon Paka caused severe damage to Guam’s forest resources in 1997 when the C. micronesica population was healthy and not threatened by any known invasive insect herbivores. Less than 2% of the healthy C. micronesica population exhibited windsnap damage during peak winds of 298 km·h-1 . In contrast, Typhoon Dolphin’s peak winds of only 170 km·h-1 caused windsnap of 6% (mean of our eight sampling sites) of Guam’s unhealthy C. micronesica population after only 10 years of A. yasumatsui infestations. Our study provides an example of how invasive species profoundly alter biodiversity and ecosystem traits in relation to a “native” abiotic stressor. Guam is so frequently visited by TCs that the island’s forests have been called “typhoon forests” . Large scale disturbances such as TCs often lead to emergent alternative states. For example, tree species with greater than average resistance to damage during a TC possess competitive advantages immediately after the TC event. Similarly, tree species with greater than average resilience following TC damage often increase in relative density and cover during the recovery period. Disturbance-dependent species are often under a state of arrested development prior to a disturbance, but their competitive advantage can become a dominating driver of ecosystem recovery following a disturbance. Successional trajectory may be highly influenced by a TC as seed bank and pre-existing seedling growth responses interact with patchy TC debris deposits and canopy openings [24,25]. In locations such as Guam, the forests (prior to the addition of anthropogenic disturbances) were arguably in a constant state of disequilibrium  because system-level recovery following one TC never reached maturity before a subsequent TC occurred. Immediately prior to the anthropogenic insect invasions, the most abundant tree species on the island was C. micronesica , verifying its competitive advantage throughout the perpetual disequilibrium caused by the historical TC frequency. This species contributed to ecosystem function for at least 5,500 years prior to human arrival , and sustained its dominant position in forest biodiversity for 3,500 years after human arrival. Then Typhoon Dolphin revealed that only 10 years of pernicious infestations of non-native insect herbivores reduced the intrinsic resistance to a natural disturbance that likely enabled C. micronesica to establish numerical dominance throughout the eons. Baker  has argued that a greater understanding of the history of disequilibrium that defined a “disturbance landscape” before superimposition of human modifications can guide continued understanding of how anthropogenic disturbances fit into the ongoing disequilibrium. Our case study provides an example that fits that agenda. Sharing successful and unsuccessful case studies with the international community is a vital step toward learning how data generation can improve global conservation efforts . Conservation decisions made by assertion rather than deduction and based on anecdotal information rather than empirical information are highly risky [31-33]. Lack of empirical information to support decisionmaking can jeopardize the conservation investments that are made . A highly successful case study can be found in the well-conceived conservation efforts of the Seychelles  where formal programs to conserve coco de mer palm (Lodoicea maldivica (J.F. Gmel.) Pers.) were initiated by including international academic scholars that contributed the capacity to publish the initial conservation research projects in peerreviewed journals . The recent initiation of in situ conservation efforts for C. micronesica was similarly characterized by nescience and inadequate literature. The experiences from Typhoon Dolphin were further evidence that international scholars with the expertise to publish in peer-reviewed journals were integral to successful initial conservation management decisions. In closing, climate change predictions indicate intense TCs will become more frequent [37-39]. A greater understanding of how TCs influence plant and system level responses is needed to form the foundation that will serve as “before” information during ongoing climate change research. We have responded to this need by studying the aftermath of Typhoon Dolphin on the island of Guam. We have shown that aspect and elevation may combine with TC wind direction to influence vegetation damage at the fine scale, as these factors integrated to generate a difference in C. micronesica tree failure (windthrow plus windsnap) from ca. 1% to ca. 23% along an elevation gradient that extended over 800 m longitudinal distance. The findings were consistent with orographic lifting as the mediating factor that led to the differences in plant damage from site to site. This was the first direct hit by a TC since three devastating non-native insect herbivores invaded Guam, and assessment of damage to a foundation tree species validated how invasive insects may negatively influence ecosystem-level traits. Windsnap of C. micronesica stems was greater in Typhoon Dolphin than in TC events that preceded the insect invasions, indicating that 10 years of pest infestations compromised the intrinsic resistance of the native tree to the native stressor. More case studies such as this one are critically needed to form the foundation of “before” studies that can inform future research on climate change. This material is based upon work that is supported by the National Institute of Food and Agriculture, U.S. Department of Agriculture, under award number 2015- 31100-06057; and by the Naval Facilities Engineering Command Marianas, Guam. Marler TE (2012) Cycad aulacaspis scale invades the Mariana Islands. Memoirs New York Botanical Garden 106: 20-35. Moore A, Marler TE, Miller R, Muniappan R (2005) Biological control of cycad aulacaspis scale on Guam. The Cycad Newsletter 28: 6-8. Marler TE, Hirsh H (1998) Guam’s Cycas micronesica popula­tion ravaged by Supertyphoon Paka. HortScience 33: 1116-1118. Marler TE, Lawrence JH (2013) Phytophagous insects reduce cycad resistance to tropical cyclone winds and impair storm recovery. HortScience 48: 1224-1226. Stone BC (1971) America’s Asiatic flora: the plants of Guam. American Scientist 59: 308-319.